When it became apparent that the glass industry was moving towards increased automation, Nelson purchased a used CNC edging machine. After a couple of years experience with this machine, discovering that, among other things, repair parts and service had to come from Italy at a very high cost, he set out to design and build his own CNC machine. The biggest problem, he explained, was coming up with a suitable controller. "We spent many months asking both hardware and software vendors a lot of questions," he said. "We were looking to reduce hardware dependence and maintenance costs. It became apparent that OpenCNC® from MDSI was the only way to go." Unlike traditional hardware or proprietary-based CNCs, OpenCNC software CNC uses no proprietary hardware or motion control cards. This open-architecture, unbundled software approach means manufacturers are not locked into proprietary arrangements for hardware, control repair, or control upgrades. Once he solved the control problem, Nelson started building a CNC machine. 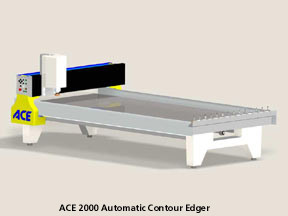 The result is the ACE 2000 Automatic Contour Edger. The ACE 2000 can grind, polish, route and drill glass up to one-inch thick and up 72 inches x 130 inches in size, with precise repeatability. It uses diamond-impregnated grinding wheels and holds 14 tool holders. Nelson is so pleased with the machine's operation and functionality that he is now plans to market and sell the ACE2000 to the industry. Opportunity to add value - Using OpenCNC's real-time open Application Programming Interface (API), the Addison crew created a special on-the-fly tool wear compensation program, constantly adjusting the radius of the tool, without operator intervention. "When we asked the other control vendors if they could do something like that, most said 'sure, no problem,'" Nelson said. "But when push came to shove, only MDSI with OpenCNC could." Customizable - "With OpenCNC, we've built our own user interface with glass industry-related terms, using Microsoft® Visual Basic®." User-friendly - "In this industry the controls are typically not real user-friendly," Nelson says. "We wanted a friendly one, and we looked all over. OpenCNC is Windows-based and easy to use, and with the customizable interface, operator training becomes much simpler." End-user benefits - Nelson was especially happy with the fact that OpenCNC uses off-the-shelf hardware and runs on a standard PC. "If a customer has a problem with his computer, he can go to any computer store to obtain repairs or replacement parts, Nelson says. "It allows them to be up and running much sooner, often the same day, without any outside technical support. With proprietary controls that is an impossibility!" There weren't really any other choices for Addison Glass, Nelson said. "Any other control had too much proprietary hardware, the software included with it was not glass-industry oriented and support would be very difficult, at best. We couldn't afford to include such 'negative' features." "We're real happy with the OpenCNC architecture," he concluded. "It's working beautifully. Now we're looking into retrofitting our old Italian-made CNC machine with the same interface as the ACE 2000. Next year, we're going to develop a five-axis machine to further enhance our capabilities." For information about the ACE 2000 and the full range of product and services of Addison Glass & Mirror, Inc., visit their web site at: http://www.addisonglass.com. For more information about MDSI's API, which allows users to write their own manufacturing software to integrate with OpenCNC, click here.